Ms Salisha Ali-Bellamy, Chairman Mr. Noel Garcia and Ag. CEO Mr. Keith Gray of the EMBD meet with The Hon. Christine Kangaloo, Minister of Science and Tertiary Education (left) and Consultants from the Land Tenure Centre, Wisconsin (right). Given the new responsibilities of managing all State Agricultural land in Trinidad, the Estate Management and Business Development Company Limited (EMBD) has embarked on a programme of developing modern land management systems to meet its needs. For this purpose EMBD recently hosted a team from the Land Tenure Centre of the University of Wisconsin, USA, for the period of March 3rd -4th, 2010. The team consisted of Mr. Stephen Ventura, Chair, Department of Soil Science and Director of Land Information and Computer Graphics Facility of the University of Wisconsin and Dr. J. David Stanfield of the Terra Institute. 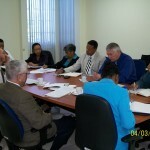 They were in Trinidad to fine tune the development of tertiary linkages with the University of Trinidad and Tobago and the University of the West Indies, Surveying and Land Information Department St. Augustine Campus with the aim of training a cadre of staff in modern land management systems. While in Trinidad, along with EMBD’s team of Mr. Noel Garcia, Chairman, Mr. Keith Gray, CEO and Ms. Salisha-Ali Bellamy, Divisional Manager-Estate Management, Mr. Ventura and Dr. Stanfield met Ms Christine Kangaloo, Minister of Science, Technology and Tertiary Education. They also met with senior officials of the University of Trinidad and Tobago and the University of the West Indies, St. Augustine campus to discuss the establishment of the programme to begin training of people in modern land management systems. This entry was posted on Tuesday, March 9th, 2010 at 5:22 pm and is filed under EMBD News. You can follow any responses to this entry through the RSS 2.0 feed. Both comments and pings are currently closed.